The nineteenth-century setting presented some conceptual problems. Only a tiny fraction of the dinosaur species known today had been discovered in Arthur Denison’s time. How could he possibly encounter dinosaurs that were not discovered and named in his lifetime? And how could all the prehistoric forms in Dinotopia remain unchanged for millions of years? Scientists have observed that isolated island populations tend toward either gigantism or dwarfism, according to what's known as the "island rule." After giving these concerns serious consideration, I had to sweep them away, because adhering to them would muddy the waters and take away from the simplicity of the poetic logic. 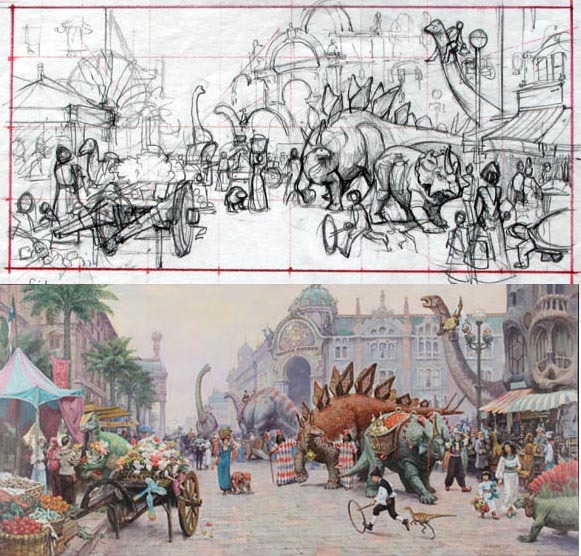 I wanted Dinotopia to be a flawed utopia in a perpetual state of instability and self-correction. There was a danger in letting it become too sentimental or preachy. I was attracted to the idea of a utopia only if it was tempered by challenges and pitfalls. Paradise needed a curmudgeon like Lee Crabb. There had to be plenty of meat-eaters nipping at the edges, not motivated by blind aggression, but by hunger. I tried to focus on the practicalities of daily life, because I felt that utopian stories risk being mired in the abstractions of politics, economics, and religion. Even though I dwell in fantasy, at heart I’m a realist in love with commonplace detail. I’m interested in the ordinariness of extraordinary scenes. That meant showing not just the parade, but the clean-up after the parade. Hi James, thanks for sharing all this great info! Love seeing the process involved in not only the practical side of things, but the inspiration, too. What is the grid on the top sketch for? Is it for compositional planning or was it for transferring the drawing on to a different surface? Nick, As I recall I used the grid to redraw the compositional study to a larger size. It just made sure I had all the element in more or less the same position. I always felt (not to sound like I'm criticising) that the problem of encountering as-yet undiscovered dinosaurs could have been solved by using more of the "skybax" type names, rather than modern taxonomic monikers. The lack of island dwarfism I was willing to ignore - isn't Dinotopia quite large in any case? Don't forget to mention Bob Harmon (the guy on the left)! He's Jack's right-hand man! He's probably best known as the discoverer of B-rex, the Tyrannosaurus with preserved soft tissue. 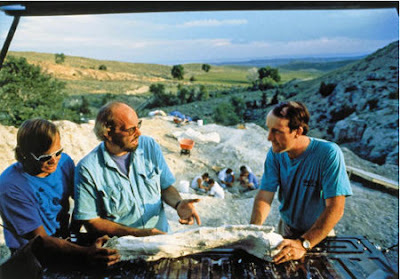 Bob is a very important individual in the world of paleontology. Són preciosos aquests apunts. Felicitacions pel teu treball. I feliç any nou. another great post!thanksvery much for sharing! hey james i have been wondering this for sometime. in dinosaur boulevard (above).is that you pictured to left of the flower cart w/ back facing camera. also is that you again next to the turquoise triceratops(? ).also thought i spotted your son on the flower cart. all just guesses not sure if im right. JoshYoungStudios: Right on all questions! Samizdat: Using alternate dinosaur names would have worked but it would have been one more set of names to keep track of, and you'd still have to step outside of Denison's narrator character to identify them. Cameron, thanks, I added the identification of Bob Harmon. "...I’m interested in the ordinariness of extraordinary scenes." That's something I was thinking about the other day before I came across this post of yours. I find this sort of portrayal of fantasy far more satisfying because it's understated. It's verisimilitude seems more convincing. 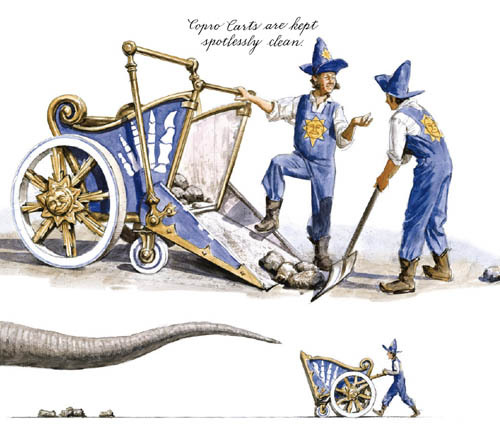 I have a question about the way Dinotopia accomodates scientific progress. I realize that at the time Dinotopia was first written, Quetzalcoatlus was believed to be a pelagic, soaring animal, something like an albatross. however we now know that it actually spent most of it's time on the ground on all fours (Naish and Witton, 2007) and fed on small land animals and carrion, much like a marabou stork. Also, how does Arthur Denison know what (for instance) a Deinonychus is when it was not named by the scientific community until 1969? Anonymous -- reasonable question, and one I considered when developing the world. 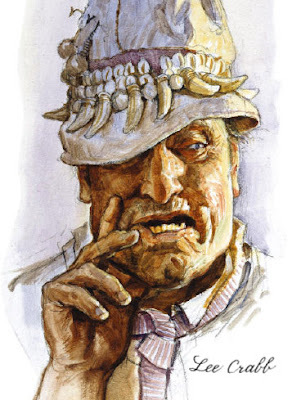 Even if Arthur was up to speed with current science, he would have recognized only a few dinosaur names; most were discovered after his time, and as you suggest, the theories keep changing. Every fantasy premise requires some streamlining logic. In this case, I didn't want to invent creatures that were not known to science, or invent a separate set of names, which would have been immensely cumbersome. It doesn't have to be though. if you've ever seen the animated movie The Land Before Time, you' ll notice that the dinosaur characters don't call each other by their scientific names. sauropods are Longnecks, triceratops are Threehorns, theropods are Sharpteeth, and so on. And it's all incredibly believable.